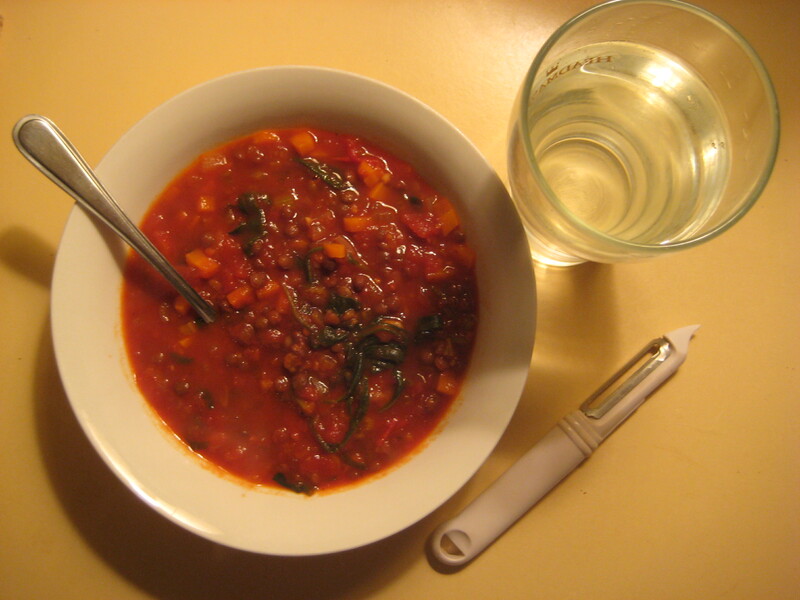 Tomato, lentil and vegetable soup seemed like the perfect dinner on a rainy Saturday night. I made this from a recipe out of my favourite cook book, and added a few things here and there. I love it when I modify a recipe and it works! I’ll probably be writing a whole lot more about my cooking adventures on here for the next little while, because I’m researching a food essay I’m writing. If anyone’s interested, I can start posting up recipes for these things I’m making. This entry was posted in food, writing and tagged bad photos, bread, food, lentils, soup, tomato, vegetable peeler, vegetables by avocadoandlemon. Bookmark the permalink. Yum. You’ve just inspired me to make tomato and lentil soup on the next rainy night Soph! It was really yum! Let me know if you want the recipe.